We are proud to introduce to you an unbelievable exclusive: Bicycle Color Collection. An elegant maxi-case enclosing 9 regular Bicycle poker size decks in 9 different colors, among which 2 amazing new backs: fuchsia and turquoise (not on sale individually). 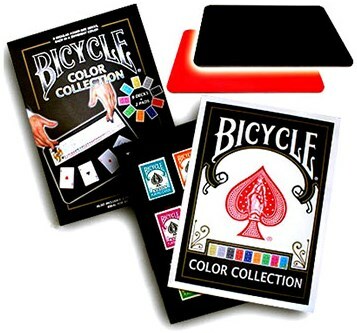 Get all the colors of Bicycle poker decks (rider back) at an unbelievable price. Included in this case you will find 9 Bicycle decks (Gold, Silver, Black, Red, Blue, Orange, Green, Fuchsia, Turquoise) and two professional close-up pads (1 black and 1 red). All the Bicycle colors available IN ONE GO! The close-up pads included are standard size (cm 40 x 27,5) and professional. They are composed of two layers: non-slip rubber under, and soft fabric above.